I expect most everyone is in a complete state of food coma at this point. Am I right? We are actually quite happily not in food coma over here just because I’ve sort of had it with food lately (the making, the eating, the documenting). December is less than a week away and that entire month is about FOOD, so we gave ourselves a little break. Plus there was work to be done this morning. We had to pick a winner for the scarf giveaway. Kaweah loves to participate in picking random numbers as long as the motivator is food. 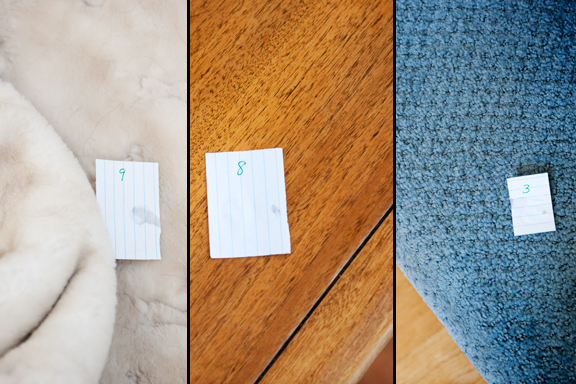 Try throwing a ball and she’ll run after the ball, then run right past it, then keep on running, until you wave a dog biscuit in the air and holler, “TREAT!” So the set up was to place ten pieces of paper numbered zero through nine around our great room with a bit of carrot on it. Then we let Kaweah into the room and recorded the first number she ate. Jeremy had to police her because the last time we tried this, Kaweah ate one number and then mowed through four more before we could stop her. Then we repeated this twice more. I’m sure some of you are thinking if she hits the first number, she’ll just return to the same place each time. Nope. Our good pup isn’t that bright. Seriously. She is totally in the moment. We took 983 mod 221 (I know a few people said they weren’t entering, but anyone leaving a comment is considered entered because it’s too much work for me to remove them) and got #99. Congratulations to Dani of Dani Dishes! You win the scarf and you get to pick the colorway of your choice! I’ll be sending an email shortly. Thank you to everyone who shared what Thanksgiving was about to you. Food was probably the biggest along with family, and some of you really tugged at my heartstrings especially remembering those who aren’t with us anymore. It was so nice of you to share with me. Our Thanksgiving was very low key foodwise because we are both swamped with work. I kept our “meal” simple, but special. 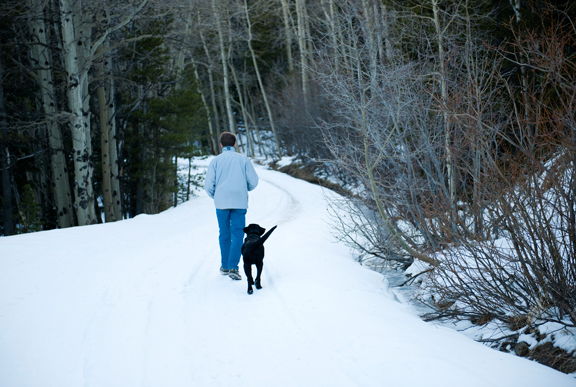 Mostly, we just wanted to have a quiet day including a nice walk before sunset. I’m thankful for the little things as much as the big things in life. What we ate for our Thanksgiving meal (it’s too early to be called dinner, too late for lunch) is known as Tiger’s Eye at our favorite sushi restaurant in South Pasadena. 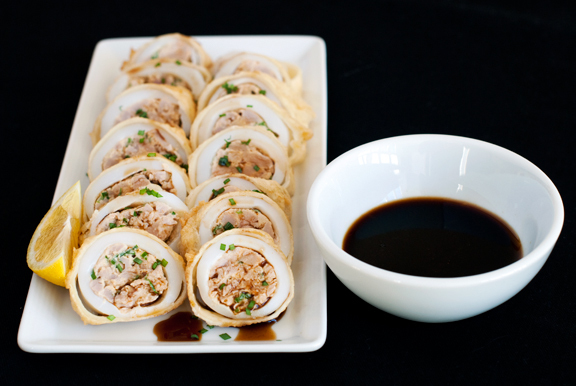 It is spicy tuna stuffed calamari that is tempura fried, sliced, and served with ponzu sauce. I didn’t have ponzu sauce on hand, so I had to make my own. The recipe I use calls for bonito flakes. I never have bonito flakes on hand either (although you can buy them in Asian markets and I recommend this – or better yet, just buy ponzu sauce). However, I did have a giant piece of dried bonito. A favorite professor of mine at Cornell gave the bonito to me during my graduate school days (years…). He told me that it is a tradition in Japan to give a bride a large dried piece of bonito like this as a wedding gift and it should last her… a really long time! It’s hard as a rock and I can barely shave it with my microplane. Instead of flakes, I get a powder, but it still imparts a great flavor to the ponzu. I haven’t worked with squid too much. When I was at the Whole Foods Seafood counter talking with my boyz (James and Dustin – two of my favorites) I asked for the larger squid tubes – as opposed to tentacles – because I thought bigger would be better. I probably should go for the smaller ones next time. It’s just more tender and delicate than what I wound up making. 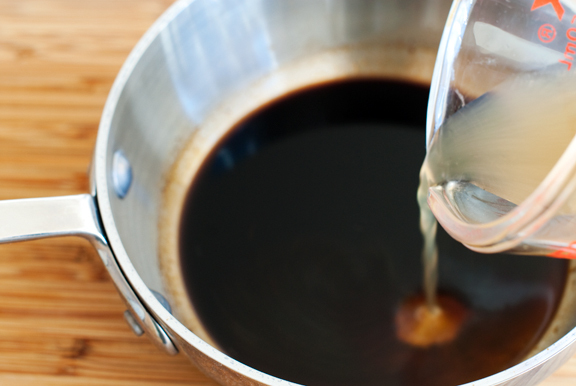 Make the ponzu sauce: Bring soy sauce to a boil in a small saucepan. Remove from heat. Add the bonito flakes and let cool. Drain the soy sauce through a sieve and mix with the lemon juice and vinegar. 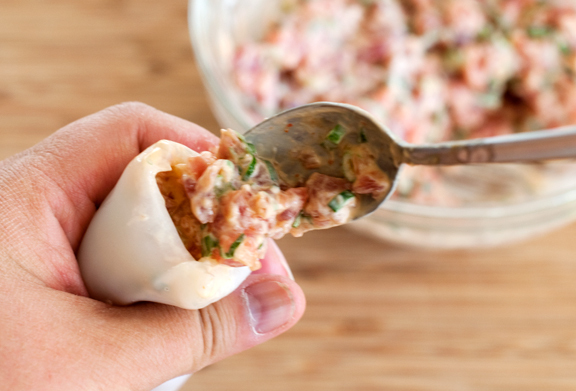 Rough chop the tuna into small pieces and mix with the green onions, mayonnaise, and Sriracha chili sauce. Fill the squid tubes with the spicy tuna doing your best to squeeze any air bubbles out. Try not to overfill since handling the squid sometimes squeezes filling out. [Then again, if you tempura fry that little cap of spicy tuna, it is AWESOME for the chef to nosh on.] 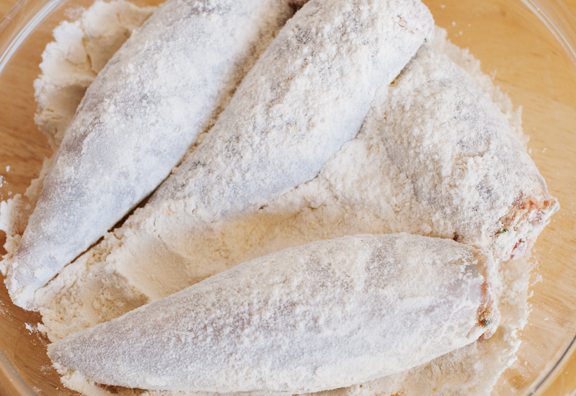 When the squid tubes are filled, roll them each in flour. In a medium to large saucepan, fill oil to 3 inches depth and heat to 350°F. You can test the oil by adding a drop of tempura batter. If the batter rises to the top immediately, you are ready. Dip a squid tube in the tempura batter and carefully place it in the hot oil, turning when one side is a golden color. Total frying time should be about 5 minutes, but it depends on the size of the squid and how hot the oil is. Remove the squid from the oil when it is golden all over and set on paper towels or on a baking rack. Slice into 3/4-inch thick slices and serve with ponzu sauce and a lemon wedge. Happy Thanksgiving Jen, Jer and Kaweah! We did Asian food, too–what an awesome and refreshing change (except for the Dan Dan Noodle Debacle…thank GOD we had plenty of other things to eat). Your feast looks delicious. Even if I don’t really want to try squid, these make me want to forget where the white parts comes from… happy thanksgiving and congrats to the scarf winner, such a lovely gift on your part ! Looks great! We had BBQ ribs with coca-cola sauce and salad. Charles then had cake and ice cream, while I had tea. It’s not turkey time over here – it’s cookie time. I’m more excited about making food I won’t actually eat than cooking for us right now. I’m making your chocolate-pistachio biscotti today, and brittle tomorrow. When I was looking for recipes, it was so nice to know I could count on you to say what was good *and* what was bad about a recipe. My gift recipients thank you. I could have a roll of those.. or ten! Looks amazingly good! This is the perfect after Thanksgiving meal. I really do not want to consume any more winter vegetables or turkey! Your non-traditional meal looks amazing. I also hate deep-frying, even more so because my laborious tempura attempts never turn out very well. Generally half of the batter migrates away from the food it was supposed to stick to, and forms those little tempura crumbs. Boo. My boyfriend’s grandma still always shaves bonito herself, using one of those boxes with a blade attached. Very cool! Oh wow. This looks absolutely wonderful. 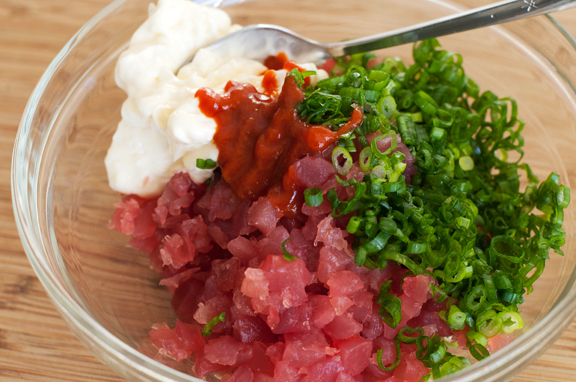 I love spicy tuna and squid – having them both in one dish is just brilliant! That’s a cool story about the bonito. And I never knew it looked like that. It does look like driftwood! 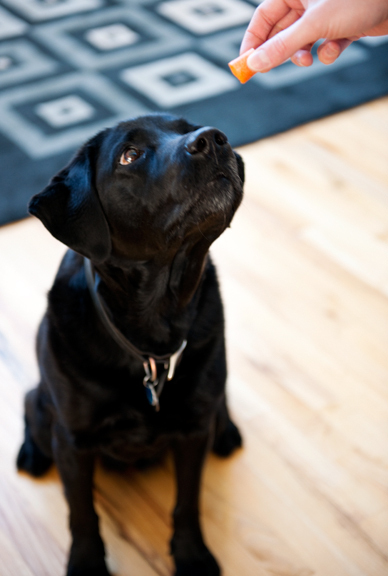 Great meal, great post, great pup hehe and a happy rest of your holiday weekend to ya. oh my oh my oh my oh my oh my!! How you tempt me…. Too much of a tease. Sigh. Happy Thanksgiving to you three!! You made me want to try to fry my Provencal stuffed squid!! I can already imagine my sister-in-law’s face if I were to bring that to T-Giving next year. Remember the reactions over my cooking geese for Christmas last year?!! I am glad to hear you had a quiet and good Thanksgiving! Mrs. K is more gorgeous everyday! 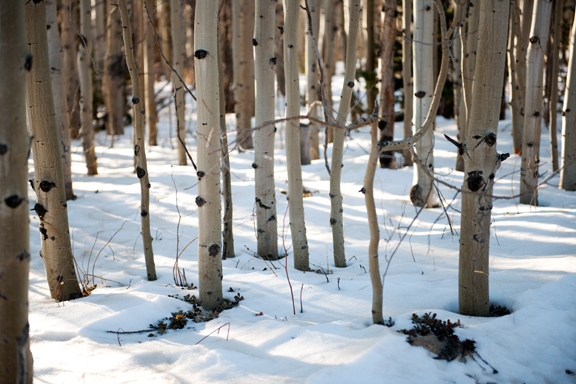 I just love love love the picture of Kaweah on the snow.. So cute.. And gorgeous stuffed squid ! Glad you had a great quiet holiday Jen. What beautiful surroundings too. Lucky family! I am so excited! I’m picking out scarf colors right now!! Yay! Happy Thanksgiving to the three of you! 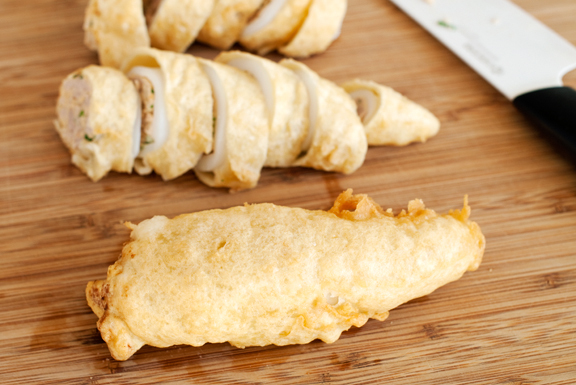 That looks like some treat – not only is it tempura squid, but stuffed with tuna as well! Triple word score! I don’t eat much fish or seafood, but I’m partial to squid and I love tempura. Liking your recipe and it’s looks fab too. 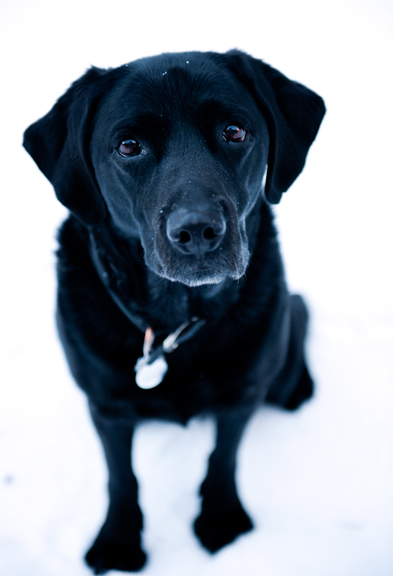 Your dog is gorgeous. This is a unique recipe! 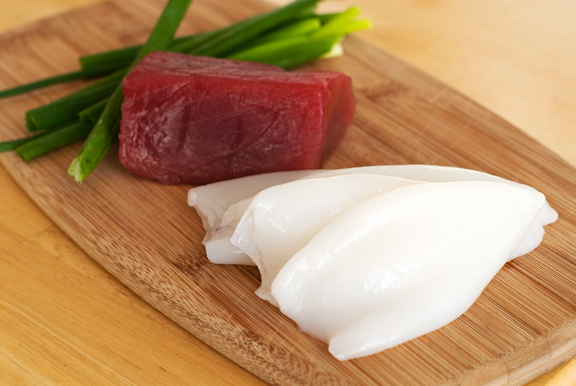 How do you balance not overcooking the squid or undercooking the tuna? One of the reasons I stop by URB is because you make it all look so doable. This recipe looks like a keeper, can’t wait to try. So cool to tempura fry! I have a pot of oil sitting on the stove top after the DB challenge! I might just give this a try! Hi Jen and thanks for all your inspiration!! Wanting to keep things really simple — but kicked up — for Thanksgiving, I added finely chopped jalapenos to the usual fresh-cranberries/orange zest concoction to go along with a southwestern style turkey … don’t know which was better. Caitlin – amazingly, because I always do a lot of “frying” recipes at once, I get so fed up and tired of it after the second or third recipe that I am done for a good long while. I hate it. Manggy – I think that’s one of the things I dislike most about t-giving. Too much food and so much wastage. No one needs to eat THAT much in one sitting. Shoshanna – That’s a good question. They all cook very quickly and since I love spicy tuna sushi, it doesn’t bother me if it’s undercooked (although it never has been so far). Just fry until the tempura is lightly golden. I’ve been reading your posts and I am intrigued with your Tiger Eye. As a displaced Los Angelean, I do miss fresh seafood and fish. Not that we don’t get most items here in Bozeman, Montana–it’s simply not the same level of freshness one comes to expect from Santa Monica Fish or the many oriental markets scattered around the area. Partly, this is because most people here have never seen an oriental person outside of the one, obligatory, Chinese restaurant–and fish takes second place to beef or elk meat here. I have been guilty of calling this area, ” a vast culinary wasteland.” It’s changing, but slowly. 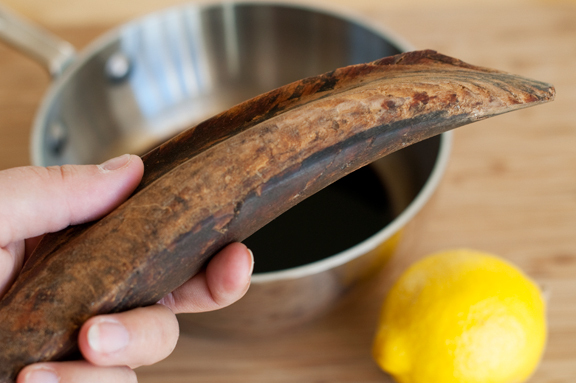 I’ve had tiger eye before but prepared differently–and I think that you may enjoy this recipe. Wrap each baton w/ nori–stuff inside tube. Broil until lightly browned. They will shrink dramatically–firmly encasing the salmon. Barry – thanks for the recipe. I may try it some time! I just wanted to let you know that I tried out the recipe and LOVED IT! But after my diet, I had to alter the recipe a little and it still came out great, using panko and baking it for 425 degree for 15 minutes. I posted the result on my blog and linked back all credits to you.